Iskender Efendi; this is the chap who invented the Iskender Kebab in the northwest city of Bursa back in the 19th century. When we moved to Turkey in 2003, Bursa was the first place we visited as part of our travels. Friends had told us to make sure we ate Iskender Kebab at the restaurant run by people said to be Iskender Efendi’s descendants. Their Iskender Kebab recipe is, of course, regarded as the best. Great really that Bursa and this unassuming little eatery is where one of Turkey’s most famous kebabs entered our lives. As home of the Iskender Kebab, Bursa is home to many specialised outlets claiming to serve the best one. And just about every city and town in Turkey has a restaurant that advertises their Iskender Kebab. If you’re looking for it, yourself, it’s sometimes also called Bursa Kebab. Iskender Kebab is not the most photogenic of Turkish dishes, that’s for certain, but when you’re in the mood for this classic dish, it really does hit the spot. Bursa has a harsh winter and the calorific ingredients that make up the meal are rich and comforting. Iskender is the Turkish word for Alexander (esp. 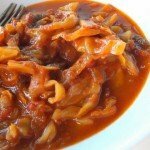 Alexander The Great), and, in years gone by, Turkish restaurants in the country’s coastal resorts have attempted to translate the name of this dish for their foreign tourist guests. Now, we’ve told you in the past about the pickle this can create. There was a period where a handful of Fethiye’s eateries were serving up ‘sensitive meatballs’ rather than ‘içli köfte’ to diners! Ahh, all good fun and lots of laughs – but there is also so much to be said for just leaving well alone when it comes to attempting to translate the names of foods. 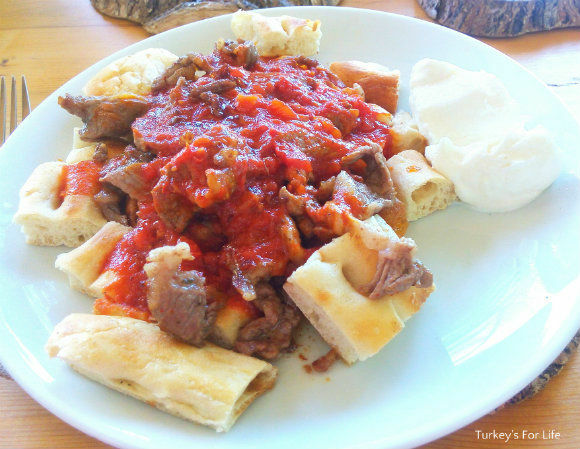 To make Iskender Kebab, lightly toasted, warm pide bread is cut into bite-sized chunks and spread over the plate. Then slithers of lamb döner meat are scattered over the top. Lamb is the most traditional meat used but beef or chicken döner can be used, too. After the meat comes the rich tomato sauce which is lathered over the top of the meat and some of the bread. A dollop of natural süzme yoghurt on the side. And then comes an extra touch of richness and comfort. A generous knob of butter is melted in a pan. When it begins to sizzle, it’s immediately poured over the top of the sauce. Yummy! Charred green pepper and tomato sometimes accompanies your Iskender Kebab, too. We’ve been a bit ‘beefy’ and ‘bready’ of late. Having only recently enjoyed a treat of et sote (which we served with bread), here we were again, back at our local butcher’s shop in the fish market, preparing to play about with more meat and bread. I think he finds us mildly amusing, our butcher, as we put on our best Turkish to explain what we want to make and ask for the best meat to use. Service with a smile but always a little twinkle in his eye, too. Two Brits making all these Turkish dishes and no idea which cuts of meat to use. After explaining that we wanted to make Iskender Kebab at home, he recommended a cut of entrecote. A 300g slab was cut from the hunk of beef behind the counter. Then, with the sharpest of knives, he deftly sliced it into thin slithers. We might not have a vertical doner kebab spit at home but who needs one when you’ve got a skillful butcher with a sharp knife, eh? Our steak slithers were set to marinate in some olive oil and dried kekik (oregano and thyme) when we got home and then I set to work on the tomato sauce. We’ve eaten enough Iskender Kebabs in our time to know the type of sauce we were looking for. This wasn’t to be rushed. Four green peppers were charred in a hot oven ready to serve on the side of our Iskender Kebab. A medium-sized tomato was finely chopped and simmered over a low heat for a few minutes in a generous glug of olive oil. Salt and pepper, grated garlic and a pinch of chilli flakes was added and stirred in. A heaped dessert spoonful of salça (tomato paste) was next and a light splash of vinegar. As the sauce simmered, I ladled in water at various stages. About 400 ml over the space of 30 minutes. Once we were both happy with the taste and texture, I removed it from the heat and placed a lid on to keep it warm. Now all that was left to do was to fry the entrecote and heat the bread in the oven. Then, we could plate up our homemade Iskender Kebab and top with sizzling butter. 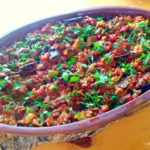 This Iskender Kebab recipe is easy and delicious. Ask your butcher to prepare your meat for you so you can get the döner meat texture. Before you start making your Iskender Kebab, marinate your steak for a couple of hours in the olive oil and oregano. First of all, set your sauce simmering. Gently heat your olive oil in a saucepan and add your chopped tomato. Stir around for a few minutes and then add your garlic, chilli flakes and pinch of salt and pepper. Once your tomato has really softened, add your salça and a ladleful of water. Stir and heat through until the salça has dissolved. Ladle in more water and add your vinegar and stir gently. Continue to add more water intermittently to keep your sauce at the thickness you'd like. After around 30 minutes, remove your pan from the head and seal with a lid to keep warm. Whilst your sauce is simmering, grill your peppers under a high heat until charred. Place them to one side. Heat olive oil in a frying pan and, once hot, start to fry your marinated beef. Meanwhile, heat your pide bread (pitta bread) until it is hot and lightly toasted. Fry your meat until browned and you also have some crispy bits, too. Now you need to work fast. Remove your bread from the oven, cut it into bite-sized chunks and divide between the two plates. Now top the bread with your beef and add a generous knob of butter to the frying pan you used for the beef. Pour your tomato sauce over both plates and add a serving of yoghurt to each. Place your charred peppers on the plate and pour your sizzling butter over the top of your tomato sauce. 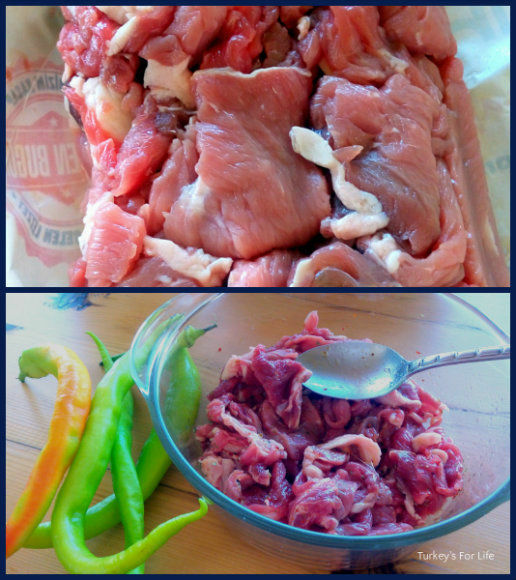 You can use lamb or chicken, as well as beef, to make Iskender Kebab at home. In Turkey, a soft, doughy pide bread is used for Iskender Kebab. If you can't get this, other types of unleavened bread will do the trick. Calories are approximate and meant as a rough guide. And that’s how you make Iskender Kebab at home. If you’re not a big fan of red meat, then Tavuk Iskender is also possible. Thinly sliced chicken rather than beef or lamb. We’ve also mentioned pide bread in this post. This is a soft doughy bread that is perfect for holding your juices without going soggy. It’s not to be confused with the bread eaten during Ramazan, here. When you shop for your bread, you’re looking for thick, unleavened bread. Oops, someone forgot the peppers! Have you spotted the slight error, yet, in our homemade Iskender Kebab photos and instructions? Well, we’re human beings. We cook and eat all our own food for our Turkish recipes section and so excited was I to photograph and tuck in to our Iskender Kebab that we were halfway through the meal before it hit me: The charred peppers were still sitting on a plate on top of the oven! We did eat them with the rest of our meal. 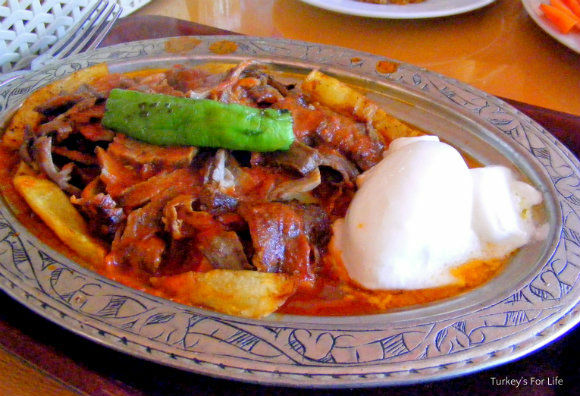 As we said at the beginning of this article, Iskender Kebab is not the most photogenic of dishes. A half eaten Iskender Kebab with green pepper certainly wouldn’t have looked too appetising in a photograph, would it? It tastes fabulous, though! I’ve just realised reading your recipe that if you take away the pide and swap it for thinly shredded deep fried potatoes Iskender becomes Çökertme.